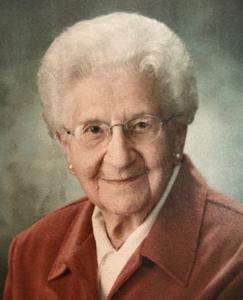 Lois Kronemeyer, age 99, of Holland, died March 15, 2019 at Freedom Village. She is now rejoicing in the presence of her Savior whome she loved and served. She is survived by her nephew, Ronald (Marilyn) Kronemeyer of Saugatuck; great nieces and nephews, Heidi (Rob) Kolean, Derek (Melissa) Kronemeyer, Aaron (Jennifer) Kronemeyer, Aleah (Keith) Horstman and several great-great nieces, nephews, and cousins. She was preceded in death by her parents, Martin & Grace (Schipper) Kronemeyer; brothers, Harold, Gordon, Chester; and sister, Ruth. Arrangements are pending with Dykstra Funeral Home - Downtown Chapel and will be announced shortly.